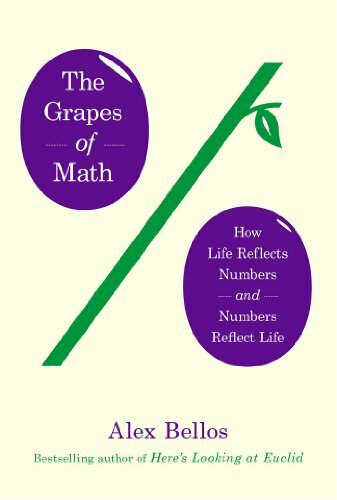 The Grapes of Math is a well-written, eclectic set of topics in popular mathematics that includes jokes, puns, and can’t lose “bar bets.” The first chapter, Every Number Tells a Story is a jazz riff on the cultural associations of numbers, jumping from approximating, rounding, aesthetics, lucky numbers, and superstitions to numbers in advertising and marketing. The second chapter, The Long Tail of the Law identifies an attribute common across lists of numbers that can be used identify fraud. Statistically, numbers with a one for a leading digit are much more common than numbers that start with nine, and this holds true whether the numbers are meant for stocks reports or sports. This attribute also exhibits “scale invariance,” which means it still holds true if miles are converted to kilometers or pounds converted to dollars. The name of this principle is called Benford’s law, and In pursuit of Benford’s law the author interviews Darrell D. Donnell, a forensic accountant and fraud investigator who examines the leading digit of bank accounts, ledgers, and election totals for number discrepancies. When Benford’s law is applied to words, it’s called Zipf’s law, and Benoit Mandelbrot (of fractal fame) used Zipf’s law in his PhD thesis. Pareto’s principle is mathematically equivalent to Zipf’s law and divides everything proportionally into 80–20, 80% of effects are produced by 20 % of causes. All three—Benford’s law, Zipf’s law and the Pareto principle—are examples of “power” laws; statistical distributions with “long tails.” Power laws are unavoidable in the social and physical sciences. Bellos also finds the cone interesting—depending on where you take a slice through a cone you can create a circle, an ellipse, a parabola or a hyperbola. Of these shapes the parabola is the optimal shape for reflecting rays of light outwards, as in a car headlight’s beam, or for converging light to a point as in the construction of solar furnaces. As for ellipses, the reader gets to meet Art. P. Frigo, Jr. the inventor of the under-appreciated elliptical pool table. Geometry is reflected in algebra, and algebra in Geometry. As Bellos notes, “two of the most researched and pondered-over areas of mathematics were nothing but alternative representations of each other.” With this connection revealed it’s but a short step to art and architecture, as for example in the hyperboloid lattice, which provides the technique for building large curved structures by use of straight beams only. This reviewer encourages the reader to google the artist Theodore Olivier for his abstract mathematical sculptures. Though the art is described, no images are presented in the text, and as this reviewer subsequently found several intriguing descriptions with no accompanying illustrations, wonders: what were the publishers thinking? There’s a chapter on cycloids, the path traveled by a point on a rolling wheel. The cycloid inspired one of the iconic toys of the 60s, the Spirograph, originally invented to engrave elaborate patterns on banknotes to make them more difficult to forge. It’s but a short step from the spirograph to the harmonograph, an apparatus that uses pendulums to draw images. For images produced by the harmonograph, the reader is encouraged to google the artist John Whitney, Sr.
From harmonographs, Bellos moves on to sinusoids and Napoleon’s invasion of Egypt. Yes, sinusoids and Napoleon’s invasion of Egypt. The connection? Jean Baptiste Joseph Fourier, the mathematician best known for Fourier analysis, the summing and charting sinusoids, accompanied Napoleon on his invasion of Egypt. Fourier analysis subsequently leaps time and space to an interview with the senior Director of Research and Sound Technology at Dolby Labs, a company today famous for noise suppression in audio recording. Bellos deftly switches topics from geometry back to numbers, in this case negative numbers. Though negative numbers were first used in India to measure debt, they were considered nonsensical in Europe well into the 15th and 16th centuries and not truly understood until the invention of the number line by English mathematician John Wallis. Confusion still remains today with respect to “greater” and “lesser” in the inability of a significant number of people to recognize that minus one is greater than minus two. As a consequence, elevator buttons below the ground floor tend to be marked B1, B2, and so on, to identify increasing depth. The mathematics community resisted not only negative numbers but also imaginary numbers, constructed by taking the square root of a negative number. Imaginary numbers are indispensible to many fundamental theorems of algebra including Euler’s identity equation, the complex plane, Hamilton’s quaternions, and Mandelbrot’s fractals. The author interviews Daniel White on a 3-D complex form called the Mandelbulb, an object co-constructed with Paul Nylander that is a form of the Mandelbrot set. Readers are encouraged to google White and Nylander to find their mathematics based art constructions. Readers will find more interesting topics in The Grapes of Math that can be covered in this short review, including a revisit of the feud between Newton and Leibniz over who was first to invent calculus, a study of the analog computers used for integration and differentiation before the invention of digital computers, and a section on mathematical proofs that is surprisingly easy to understand. In Bellos’ serendipitous style, proofs lead to algorithms, and algorithms lead to bar bets the reader is guaranteed to win. There’s a chapter on logic and set theory and the paradoxes raised by self-reference lead to the mathematicians Bertrand Russell and Alfred North Whitehead and their book Principia Mathematica. Principia Mathematica is followed by meta-language and Alfred Tarski. The last chapter provides an interview with Paul Chapman, a devotee of the algorithm known as the “game of life.” The game of life is a particular expression of rules for cellular automata, which are discrete mathematical models with fixed local rules that can generate complex behavior on a larger scale. Though the game of life was invented by the mathematician John Conway, cellular automata were first conceived of by mathematician and physicist, John von Neumann. The Grapes of Math concludes with an interview of Stephen Wolfram, inventor of the calculating software Mathematica and another devotee of cellular automata. As a meandering collection of facts, stories, curiosities, and oddities in mathematics, The Grapes of Math is as entertaining as it is enlightening.